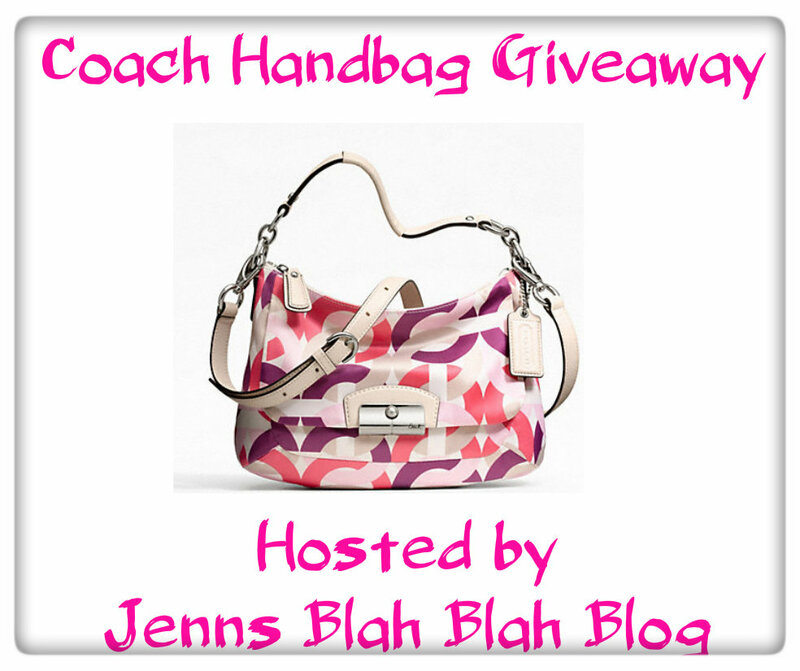 I know lots of you love handbag giveaways, so I try to find them for you! Here's a new one - enter for a chance to win it! Who loves Coach? If you love Coach than you’re going to love this op art chain-link print fabric with leather trim handbag. It has an inside zip, cell phone and multifunction pockets, sip-top closure, fabric lining, hand with 5 ¾” drop, as well as longer strap for shoulder or cross body wear. It’s a nice summer handbag, and one of you will win this amazing handbag. If you haven't heard of Sweepstakes Max you're missing out! Bloggers it's the best way to list your giveaways, and if you like to enter giveaways you will find TONS of great giveaways at SweepstakesMax.com. Disclosure: This blog is not responsible for shipping prize to winner, Jenns Blah Blah Blog will be shipping the handbag to the winner. I was not compensated for my part in this giveaway. If you have questions, please feel free to contact Jenn at jenn@jennsblahblahblog.com or info@pinkninjamedia.com. What I like about summer is that things seem to be a bit more relaxed. There is not the rush rush that there seems to be the rest of the year. I like the more casual attitude and the being able to just sit and read outdoors. I love the going for a walk after dinner because you can. 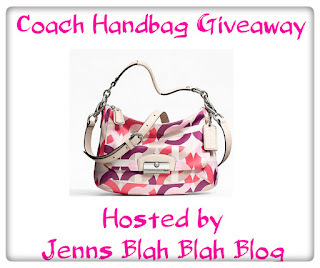 Thank you for the great giveaway!I love Coach handbags. 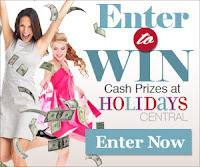 This is such an awesome giveaway i hope to win! I love going to the beach at night and having a barbeque with my friends. The weather is cool and its so relaxing. Love playing with water toys with my one year old daughter in the driveway! I love going on vacation during the summer. I love going to the beach and the amusement park during the summer. The sunshine, being able to go out without wearing jacket/coat. I love walking on the beach at night with my hubby! I love going to the beach in the summer. - Judith R.
we love going to the beach, the pool and the zoo. I love hanging out at the pool and grilling steaks and hotdogs. We have so much fun swimming and hangin out with family and friends. It is my favorite part of summer. Given where we live, spring and fall are more enjoyable. The tourists are gone and we can enjoy Kissimmee/Orlando attractions without the crowds. My favorite thing during the summer is cooking our and going to the river/creek. I love to hang out at the pool with the kids. we go to the block partys around the county. I like going to the beach on Lake Michigan here in town with my family. We usually do a cookout and watch the boats go by while feeding the sea gulls. I love beaching it! The water is the best during the summer! I love having cookout, going camping and just spending time with my family. I really love summer because I get to take photos with pretty green foliages haha, I'm one of those people who love sunlight and bright blue skies. I am going to see the falls. I love watching all of the different flowers in our yard bloom. Some of them were originally planted by my great-grandmother! My favorite thing about summer is that the days are longer. This makes it so much easier to spend time with friends and family rather than the cold, short winter days that seem to end the nights early! Another fav about Summer is day trips around your area to uncharted territory! I LOVE summeer rain! My son & I go 'Puddle Stomping'. It's the best, we just play & laugh & jump in puddles. Just like I did as a kid. I go to college far away from my family, so during the summer I love to come home to my little brother and boyfriend. It feels so good to be back home and just be able to sit by the pool and spend time with everyone! I love going for a ride in my convertible with my husband in the summer, especially for a day down Cape Cod! I really love the beach and the warm weather. I love that I can go out with the people I love during summer. I like spending time with my family on vacation. The best thing about summer is seeing my vegetable garden hugely green and lush. I love summer because I get to spend more time with my daughter. Since she is not in school and does not after school activities we can explore our city and surrounding area. And its quality for just us girls. Enjoy summer make me a winner!! I like that I get to travel with my children during the summmer months. My favorite thing about summer is all the wonderful fruits and vegetables! Love taking walks in the late evening when its still warm and light out. I love to be out and about (preferably with my camera) and enjoy the warm temps and longer daylight hours! My favorite thing about summer is going golfing! My favorite thing to do in summer is sit out in the sun with a good book and a cold drink and watch my kids play in the pool. Having a BBQ and spending that extra time with friends and family. I like to go to the pool and swim. I love picking produce out of our garden with the kids! Summer is the time that the kids are off and my husband takes it easier! We take spur of the moment day trips or maybe just go for dinner in an out of the way spot! As the song goes, "The living is Easy!" I love to swim so the beach and pools is where I prefer to spend my time in the summer. I enjoy playing baseball with my son. I like camping with my family. My favorite thing about summer is going to the beach and visiting friends and family. I just love to lay out in the sun on my beach chair and read my magazines!! I LOVE SUMMER!! I love to fish. It calms me, excites me, makes me a part of the world. We love to take side trips in the summer and see the interesting sights in our state. I love to take my daughter swimming. She loves it and I know it makes her happy so even though I'm not in the mood, I still take her. She's my little angel and would do anything for her. I enjoy going to the community pool with my grandsons to swim. Also we enjoy going to the movies to sit in the cool theater. We love camping and swimming. Taking my children to the community pool. They have so much fun. My favorite thing about summer is all of the fresh local fruit and veggies that are available. I love the smell of cut grass! My favorite thing to do is lay in my pool with a sweet tea and a book and watch my kiddos swim! Favorite thing aout summer is taking nature walks with my grandson and just talking. My favorite thing about summer is just having more time to spend with family. We love to have long days at the pool with late dinners. I also love the freedom of being relatively "schedule-less". In Ohio the beautiful weather only lasts a short while - and we enjoy it while we can! My favorite summer things are swimming outside, going to all the summer movies, and my town has an extravaganza where there's a craft fair, vendors, and fireworks at night! Thanks for the giveaway…spending more time with my kids during the summer i.e. swimming, tennis, beach, etc. I love going to the water park and to picnics during the summer! I adore taking my granddaughters to the waterpark as often as possible. I love their joy.